First, thanks to TOTM for organizing this symposium on a most timely and important topic. As computers and technology have revolutionized every aspect of human endeavor it is a particularly critical time to ask ourselves why 21st century law schools closely resemble the law schools of the late-19th century and why in court litigation would seem relatively familiar to Clarence Darrow. One significant answer is the regulation of the legal profession, and one possible solution is significant deregulation. My particular interest in the topic is the role that the American judiciary has played in generating the remarkably lawyer-friendly regulations that govern the practice of law. (Self promotion alert!). 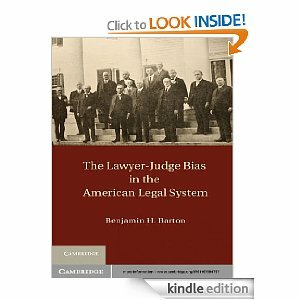 Cambridge University Press recently published my book entitled The Lawyer-Judge Bias in the American Courts. The book starts with the relatively unremarkable observation that virtually all American judges are former lawyers. The book goes on to argue that these lawyer-judges instinctively favor the legal profession in their decisions and that this bias has far-reaching and deleterious effects on American law. The book notes many reasons for this bias, some obvious and some subtle. Fundamentally, it occurs because – regardless of political affiliation, race, or gender – every American judge shares a single characteristic: a career as a lawyer. This shared background results in the lawyer-judge bias. The regulation of lawyers is a prime example (in fact it’s chapters Five and Six in the book). American lawyers have a unique regulatory structure. Every other profession – from cosmetology to medicine – is regulated in the first instance by state or federal legislatures. State legislatures generally set up regulatory agencies for each licensed profession and the efficacy of these agencies are a subject of some debate. That said, at least every other American profession must push their policies and regulation through a legislature made up of members who generally practice another profession (ironically enough many state legislators are lawyers). As such, state legislatures generally serve as some check on other professions. The legal profession, by contrast, is governed in all fifty states by state supreme courts. These Courts frequently delegate the actual nuts and bolts of governing lawyers to bar associations or other administrative bodies. Predictably, this regulatory structure favors the interests of the legal profession over those of the public. Interestingly, it was not always thus. During most of the nineteenth century, lawyers were largely unregulated and what regulation existed came from legislatures not courts. There was almost no formal regulation of lawyer behavior and barriers to entry like a bar exam or the law school requirement were unheard of. Bar associations were weak or non-existent. Admittedly this period was pre-industrialization, but note that it is not unthinkable or impossible to have a deregulated market for lawyers; to the contrary, we’ve done it before. In the late-nineteenth century bar associations began to reform. Priority number one was lobbying courts to step up the regulation of the profession. Over time state supreme courts have taken control of lawyer regulation and have created the complex web of regulations that now govern the legal profession. State supreme courts obliged by claiming an “inherent authority” to regulate the legal profession as an outgrowth of the constitutional separation of powers between the legislative and judicial branches. State supreme courts used this “inherent authority” to seize entry regulation from the legislature, conduct sua sponte investigations of the unauthorized practice of law, and even to make many bar associations unified or mandatory. In states with unified bars, a lawyer must be a member of and pay dues to the state bar association to practice law in that state. Obviously, a mandatory bar association has significant benefits for the legal profession in those states. In many of these states, the Supreme Courts ceded control over the profession to the unified bars, making lawyers in those states the most self-regulated professionals in the world. Further, like a closed union shop, the mandatory collection of dues and the associated political clout of having all lawyers be members of the bar association are significant advantages to the profession. I raise this history and the close interplay between the interests of judges and lawyers to note how difficult any deregulation effort will prove. State supreme courts govern lawyer regulation in all fifty states. There have been federal incursions by the SEC and others, but judges control the nuts and bolts of both entry and conduct. Any large-scale changes to regulation will likely have to go through state supreme courts and if history is any guide those courts will naturally (and frequently unconsciously) care more about the needs and desires of bar associations and the legal profession than the public at large.